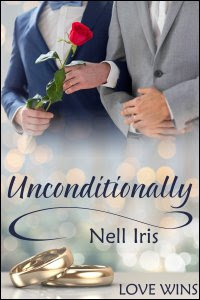 Super sweet slice of life novella about two men in love, about to get married, and one man's mother's hang-ups about his sexuality and gender expression. I absolutely loved Luca and Gus, and how strong and supportive their relationship was. Gus loved Luca for who he was, without trying to change him, offering him unconditional love and support, no matter what. Luca loved Gus for a variety of reasons, one being that Gus let him be who he is, without judgment, without fear, all the while telling him that he's beautiful and strong and kind. Gus' parents embraced Luca because they realized how happy he made their son. I wish that Luca's mother would grow a heart and see how much love and happiness Gus brought to Luca's life, instead of trying to force her son to be the version of himself that she expected. Told from both Gus and Luca's POVs, this book is adorable and delightful and just perfect for a pick-me-up after a long day. Enjoy a glass of wine while reading, have a tissue or two at the ready, and revel in this short glimpse into what makes Gus and Luca's relationship so utterly amazing. I'm hooked! looking forward to reading Unconditionally.